Real Good Foods, the brand behind the incredibly delicious and widely available protein packed Real Good Pizza, now has Real Good Enchiladas. The new release is just like the creative company’s other functional food, providing a good amount of protein with all real food ingredients in the form of enchiladas. The Real Good Enchiladas come wrapped in a hand-rolled chicken tortilla crust, similar to how the brand’s Real Good Pizzas have a chicken crust. Each box of the great looking product comes with two gluten-free enchiladas providing a combined 20g of protein, 9-10g of fat, just 4g of carbohydrates with 1-2g of that sugar, and 190 calories. 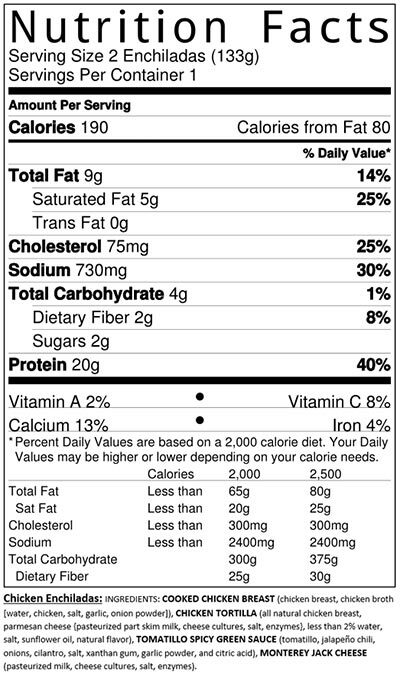 There is an exception to those nutrition numbers listed above, as they cover only three of the four Real Good Enchiladas flavors. Those three are the Pork, Chicken (label above), and Beef options, with the other flavor Cheese, having a very different mix of macros. Real Good Foods’ Cheese enchiladas actually have more protein, more fat, resulting in, of course, a lot more calories. Each box of the Cheese enchiladas provides 25g of protein, 25g of fat, 5g of carbohydrates, and a calorie total almost twice that of the other flavors with 350. You can now order any or all four of Real Good Foods’ new Real Good Enchiladas through realgoodfoods.com. They’re priced exactly the same as the brand’s delicious protein pizzas ranging from $5.99 per box for 12 boxes to $4.50 per box for 30 or more.